The Menninger Clinic activity therapy staff are having their fun on 'Hat Day". 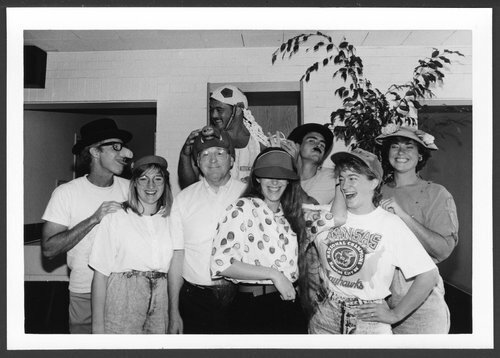 Left to right are Roger Nyfeler, Barb Shapiro, John Barrett, Dan Albury, Leigh Humphries, Andy Hines, unidentified staff member and Holly Smith. The Menninger Clinic philosophy of treatment was the bio-psycho-social approach. This philosophy of treatment integrated medical, psychodynamic, developmental, and family systems to treat the total health of patients.